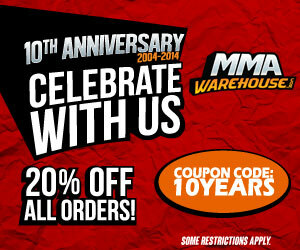 Bad Boy MMA’s Scraper Fight shorts have been around for quite some time, and have proven to be one of the best fight shorts available. Both in terms of construction and design. These fight shorts are created with “ballistic” nylon material, that has been through a rigorous development process that ensure they are strong and durable enough to withstand the roughest scrambles and fights, they are tear-resistant. This fabric is also breathable, light-weight and most importantly dries quickly so it wont harbor as much bacteria and stink. The sides feature split-seams that have the triangle stitch for increased flexibility and movement. As far as the design goes, it’s very intimidating – just like Lyoto Machida and Diego Sanchez, top UFC fighters officially sponsored by Bad Boy MMA. The shorts have unique design points as well, on the front there is a “Strength Tattoo” logo screen print with the signature embroidered patch on the opposite leg. 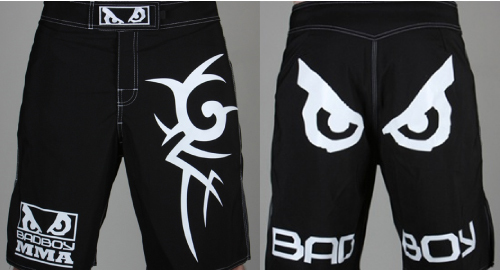 On the backside there is the infamous Bad Boy eyes logo that really make a high-impact and unforgettable look to the shorts.